Hail Damage Insurance Claims - ALL RISK PUBLIC ADJUSTERS "
Supercell thunderstorms and tornadoes often leave hail damage in their wake. No building or roof type is exempt: homes, businesses and government property with metal, tile, cedar shake or modified bitumen roofs can all suffer hail damage. Fortunately, chances are good the damages are recoverable. At ALL RISK Public Adjusters we help property owners in Pennsylvania, New Jersey, Delaware, and Maryland file hail damage insurance claims. We are familiar with the tactics insurance companies use to minimize hail damage settlements and see to it that your claim enables a full recovery. The primary challenge associated with hail damage insurance claims is the discretionary nature of the insurance adjusting process. While visible damage from a severe storm should be obvious and undisputed, the scope of damages and policy coverage determined by the insurance adjuster may not be to your satisfaction. Insurance companies and their adjusters often have different adjusting standards. Even the insurance adjuster’s training and experience with hail damage insurance claims can impact your settlement. 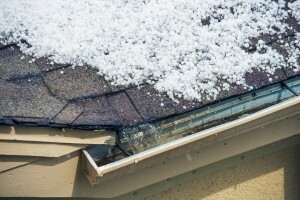 In a hail damage insurance claim, the insurance company may pay to replace the complete roof or to patch a portion of the roof. The insurance adjuster may apply depreciation to the claim, reducing the scope of loss and price of repair based on previous wear and tear to the roof. In some instances, insurance adjusters have been known to dispute that damages were, in fact, caused by hail. Our certified public adjusters represent you during a hail damage insurance claim. We make sure you understand your rights and coverage under the insurance policy terms and conditions, and hold the insurance company accountable to them. We document the damages and see that the adjustment process is handled with your best interests in mind, ensuring that you get a fair and honest settlement in a timely manner. Call ALL RISK Public Adjusters today for help with your hail damage insurance claim.